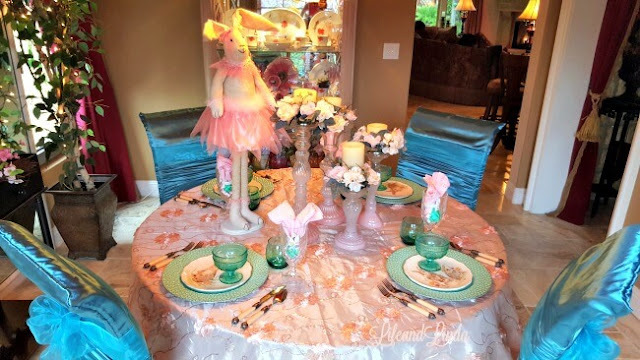 A cute bunny table for Spring, using pink and blue green. I have been missing in action again...sorry. Busy designing more blogs. Ellen from Scribbler Unfocusescribblerunfocused.blogspot.com decided she needed some changes. She has a fun blog, bohemian style colors. Be sure to drop be and check out her new look! The compotes and small wine glasses also match this pretty color of blue-green. I love these pretty chargers. The color caught my eye. They look wonderful on the pink tablecloth. 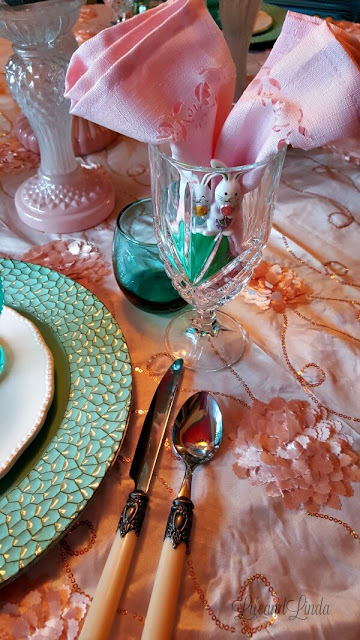 Pink napkins hold a green-blue egg that sits in the water glasses. Two sweet little bunnies hold the napkin. I dressed the chandy again with the roses garland. 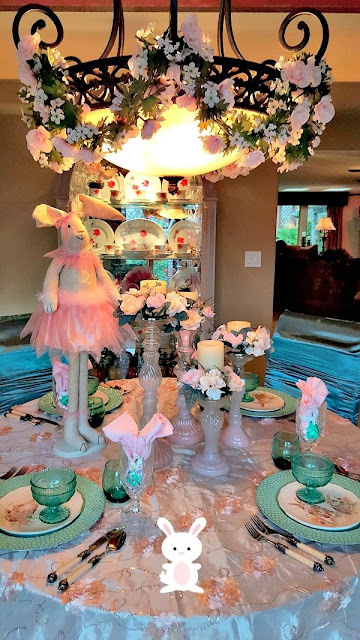 The tall pink bunny takes her place among the pink candle holders. My newest find is those lovely candle ring wreaths. I went to the Flea market with my Mom and found them there. Great price at $2.00 each. I also bought some purple ones. I think I will go back and find more colors. I have been looking at some similar ones at Grandin Road, but more expensive. to have them in purple tooI found the bunnies plates at Pier1. Love miss Bunny. She looks so pretty in pink. Don't forget we have our link party on Sunday afternoons. Easter is blessed..I know..but geesh it's so cute too. What sweet bunnies. Love the bunny plates set in those lovely charger plates. The bunny plates are adorable, but the chargers are what really caught my eye! What a gorgeous shade of aqua. Oooooooo!!!!!!! Those bunny plates Linda, those are darling! Your tablecloth, your choice of colors: SPRING! We have a way to go here in Minneapolis, but we'll get there. And when we arrive, will I ever celebrate! Very pretty! I love, love, love the chargers - can see all sorts of ways to use them - a beach theme would be perfect too. Ooh Linda, I love the pink and aqua together. 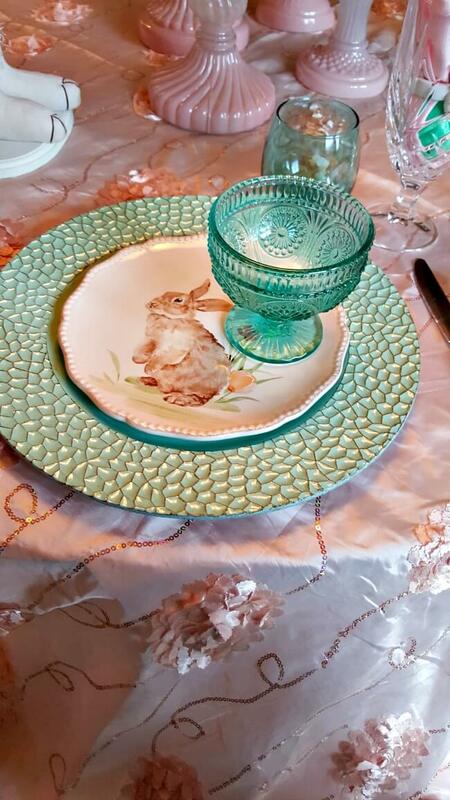 Your sweet bunny makes the perfect hostess, too. 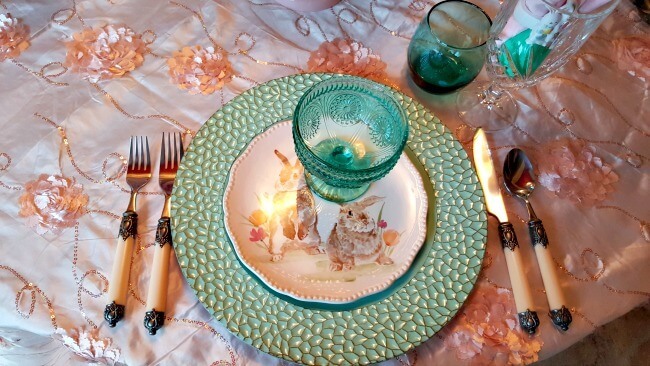 Those candle rings look so pretty, and it's those plates that stole my heart...sigh! I had to get here this morning before I began my day of outside activities and I am SO glad that I did. 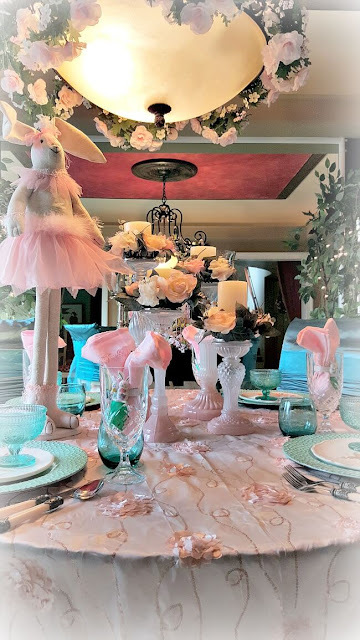 I adore the soft pink table setting and these bunnies combined with the plates, this dreamy table cloth and napkin rings are perfectly perfect. Have a happy weekend, dearest! This is so cute Linda! That bunny is adorable and I love the color mix here. I got those same plates at Pier 1- they're adorable. Those are neat chargers- love the little texture they offer and of course the color too! I love rabbits, so I love this! Loving all the cute bunnies! I just got one that I have been looking all over for! 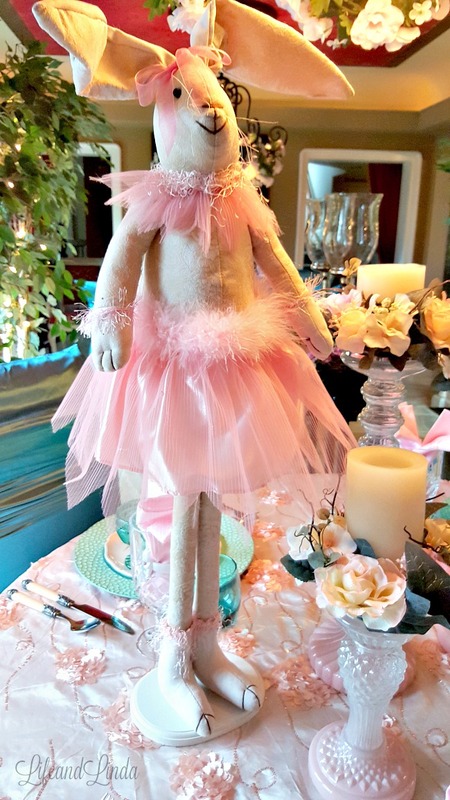 I am so excited to use him for Easter brunch! Your table is precious, Linda! The rose garland makes it look like a garden setting. I think we have the same bunny! Maybe not, they are all so darling. 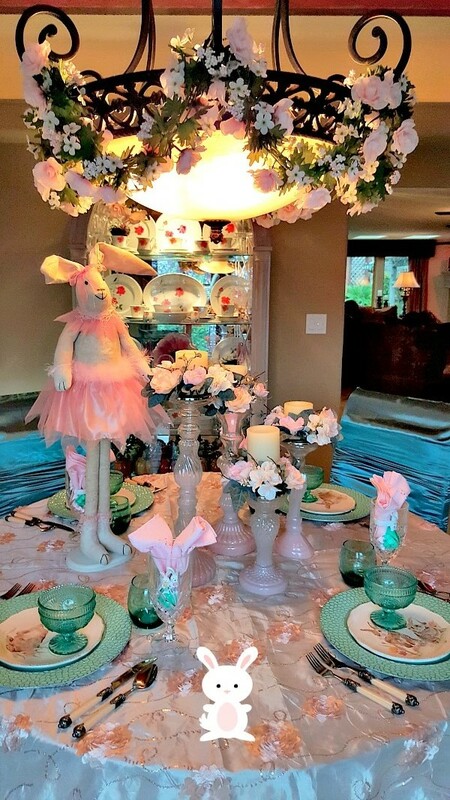 Love your pink ballerina bunny overseeing this pretty Easter/Spring table! I have some of the PW pieces too, love her new line and all the mix and match possibilities. Ellen is a good friend of mine, and her personality is as colorful as her home! I am off to check out her new look now, the peek looks great! Your tables are always beautiful. Love this one too! I'll be back for the party!! Oh, I love these soft pretty colours, Linda! Before we know it, Easter will be here. I'm SO ready for Spring!